When the weather turns cold, I like to treat my chickens to some warm oatmeal. They go crazy over it! Sometimes I just give them plain oatmeal; other times I add in whatever I have on hand to increase the nutritional value. This time it was oatmeal with leftover crumbled falafel, pepitas, and chia seeds. I mostly wanted Jobin to get some extra protein for her feather production, so I made sure she got a good helping. And I was hoping the oatmeal would warm her up a bit since she's pretty bare at the moment. I gave Jobin a little bit in a bowl to herself, then put several more bowls out where the other chickens were. But I couldn't fend off the others for long after they finished their share. I swear that Sylvester thinks he is a chicken! He tried to sneak a bite, but the chickens wouldn't allow that. So he was fine with just hanging out while they ate. When I take a treat out to the chickens, I've learned that I had better bring something along for Duchess too or she will push the chickens out of the way and steal their treat. I've never seen her turn down any food (she eats weeds and leaves for crying out loud), so I figured I'd just make an extra big batch of the oatmeal treat to share some with her as well. I love giving my animals treats, but I try hard not to overdo it. I usually just bring a special treat like this once a week, if that. It is important that chickens get plenty of their feed so they are getting adequate protein, calcium, and other important nutrients, so I don't fill them up on other stuff. Do your chickens like oatmeal? What is a special winter treat that you give to your flock? I don't have chickens, but my ducks get plenty of kale. I grow lettuce and kale all winter long so they will have plenty of fresh greens. The photo of your cat watching the chickens eat is hilarious! I don't have chickens but certainly love hearing about yours! I love that they have special treats and that oatmeal warms them too! Happy Weekend my friend! On really cold mornings, the chickens LOVE warm baked potatoes. Potatoes MUST be fully cooked though because the skins contain a toxin when raw. I know how much I like warm comfort food on a cold winter day, I can only imagine that the chickens feel the same. But, everything in moderation- we feed mostly a good quality crumble. The chickens I had are in the freezer now (because they were meat birds), but while they were with me this summer I picked greens for them every day, sometimes twice a day. I think one of their favourite treats was the spent broccoli plants from the garden...and sorrel. They really went for sorrel. I don't have chickens, but the neighbors' chickens come to visit. Right now they are loving the grass seed we planted in the front yard. Sylvester and Duchess are sweet. So wish we had some chickens.. Someday, perhaps.. 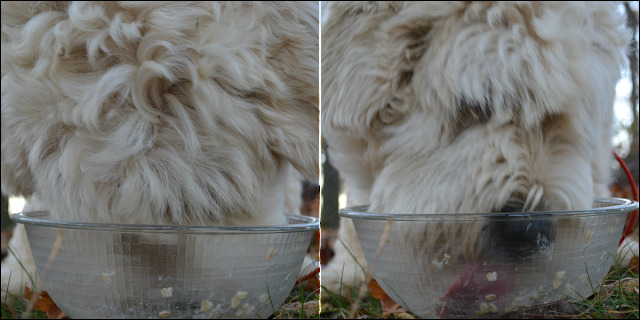 The doggy looks so cute eating her oatmeal!! What a great treat!Have a great weekend! I can't wait to have chickens so I can try this as well; until then I'll just have to enjoy yours vicariously! What breed is Duchess? A doodle? We've a goldendoodle named Lily. Duchess is a mix of sheepdog and great pyrenees. But I have thought before that she looks like a doodle! I don't have chickens or any pets but I love seeing yours. Poor Jobin looks like she needs the extra treats. Lucky chickens! The only treat I've ever made for mine is popcorn. Thank you for visiting my blog through Top Shot and leaving a comment. I've never heard of someone cooking oatmeal for their chickens before. I'm going to have fun with that one in my social circles! I traveled through Missouri a couple months ago and enjoyed every mile. Now, they are spoiled chickens. I love your chickens and your pretty dog, Duchess. What kind of dog is Duchess. Great post, have a wonderful weekend! what a great treat! lucky, happy chickens! i love your chickens and your beautiful dog. That's nice that you brought oatmeal. The pics are neat. I am going to have to try oatmeal, that is a great idea. I know I have fed them leftover grits before and they love that. That is so cute that your dog wants treats too no matter what they are. She looks very sweet. You chickens and pets look very happy! I like to give my chickens left over grains, like cooked rice, oatmeal, of veggies, and I love to give them melons and a head of cabbage now and then, too! We go out daily and give them little snacks, but not enough to take away from their main diet. They mostly free range and have free choice food, during the summer. And then in the winter I feed them free choice, but love to add in a warm snack of crumble and garlic with some warm water stirred in. Just found your blog...love your chicken stories! Seems as though we have a lot in common! Our chickens love special treats too...one of their favorites is popcorn. Our ladies get quite a few treats because we have set up a little "bartering" with our elderly neighbors...they save their veggie and fruit peelings and old bread or rolls in exchange for fresh eggs. My "ladies" are certainly well loved by the whole neighborhood! Just love your blog...I will be back again soon! Pumpkins and Winter Squash with their seeds and boiled potatoes. All from our garden.